"Is all of this supposed to impress me?" 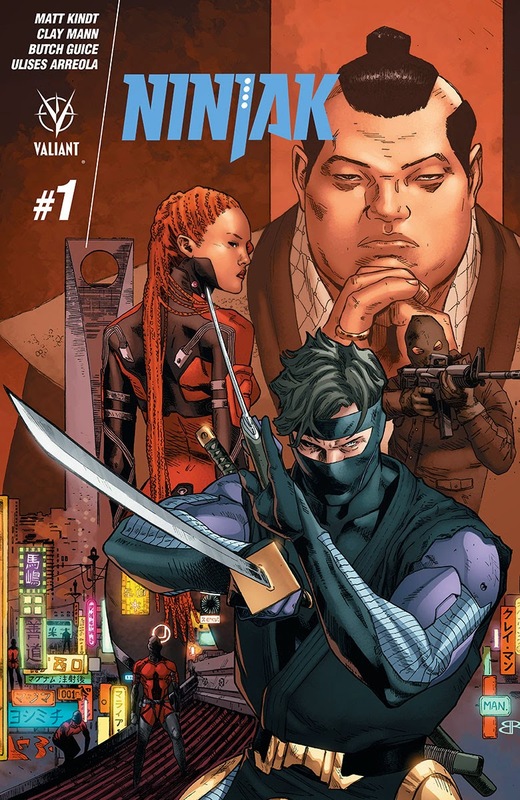 If there's any publisher who could make a character who's equal parts James Bond and Shinobi, it's Valiant Entertainment. 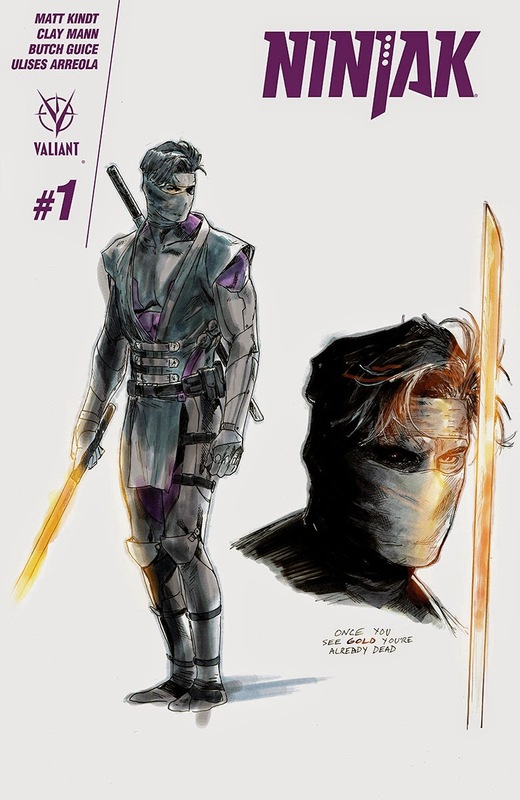 That character is Ninjak and after appearing as something of a peripheral character in many of Valiant's other titles, he gets the chance to shine on his own. 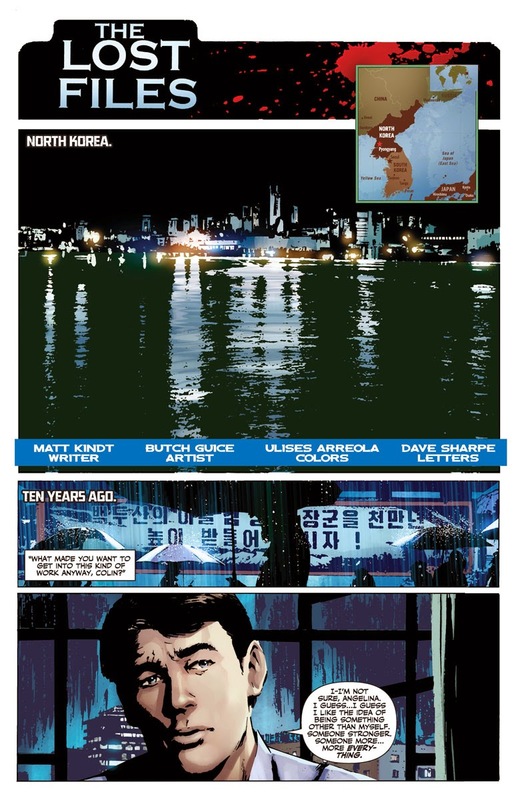 Ninjak #1 has him shining pretty brightly. The issue is written by Matt Kindt, penciled by Clay Mann, inked by Seth Mann, colored by Ulises Arreola and lettered by Dave Sharpe. Then: Meet inexperienced MI-6 recruit Colin King on his first mission in the field as he learns the basics of spycraft and counterintelligence, and develops a volatile relationship with his first handler. 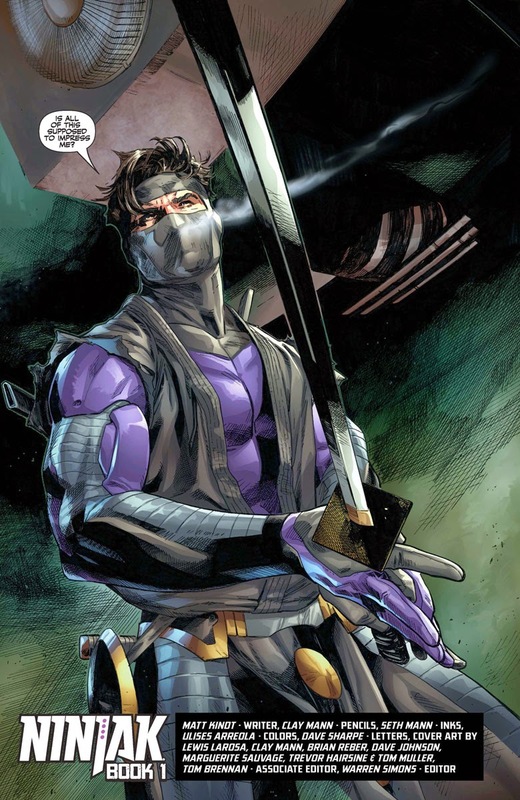 Now: Colin King is Ninjak, the world's foremost intelligence operative, weapons expert, and master assassin. And he's hunting the Shadow Seven - a secret cabal of shinobi masters with mysterious ties to his training and tragic past. 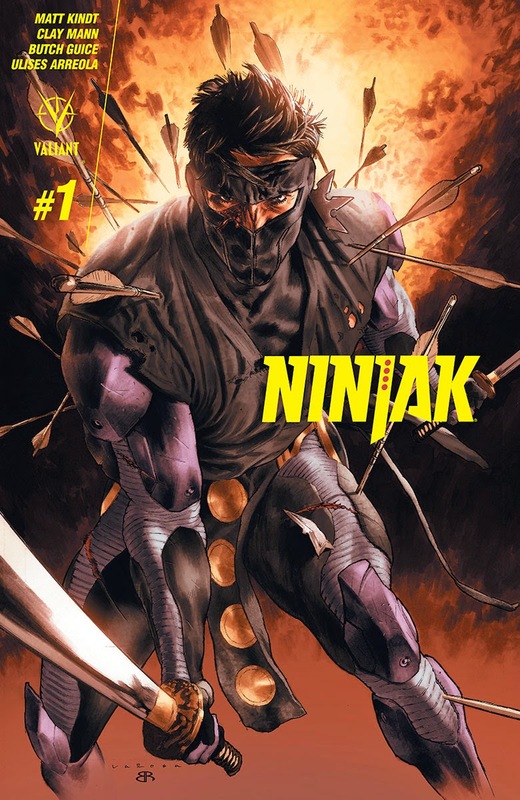 If you've been following Valiant Comics at all since its rebirth, then you know who Ninjak is. 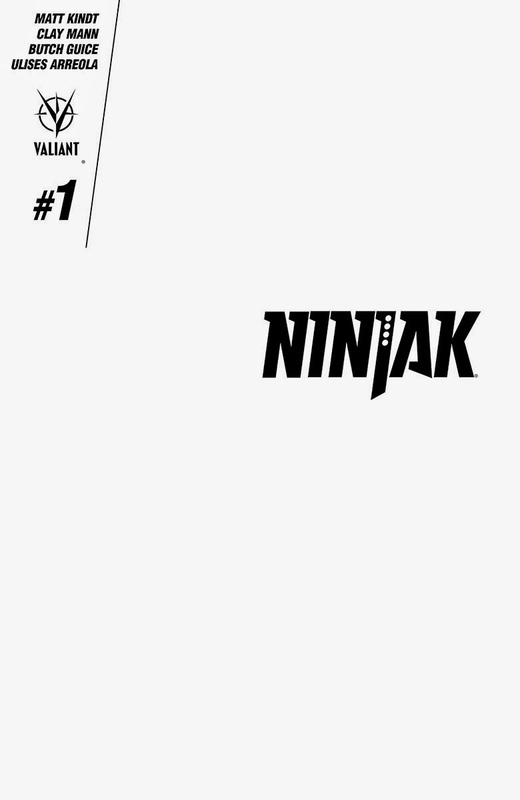 If you haven't, first of all shame on you, but second of all, Kindt does a marvelous job of introducing the reader to the character in Ninjak #1. 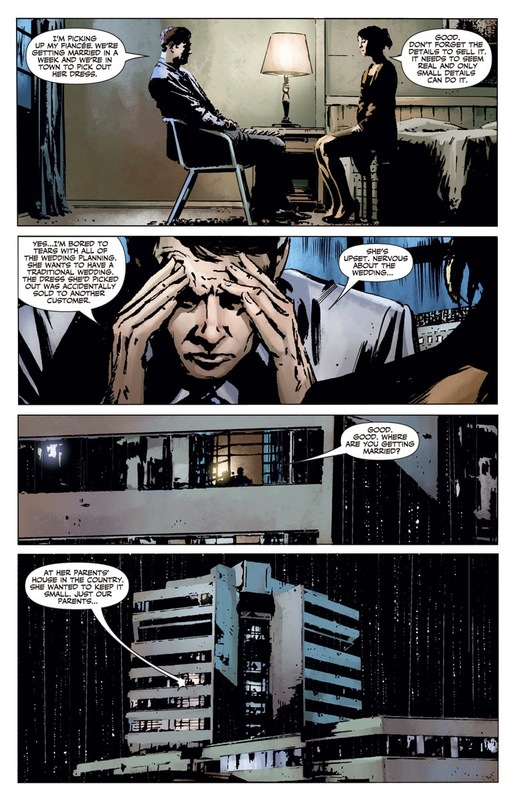 The use of "Then" and "Now" scenarios are pretty powerful in laying out the varying pieces that make the Ninjak whole, including a double-edged sword of an upbringing and a supreme confidence and cockiness pervasive throughout his entire life. 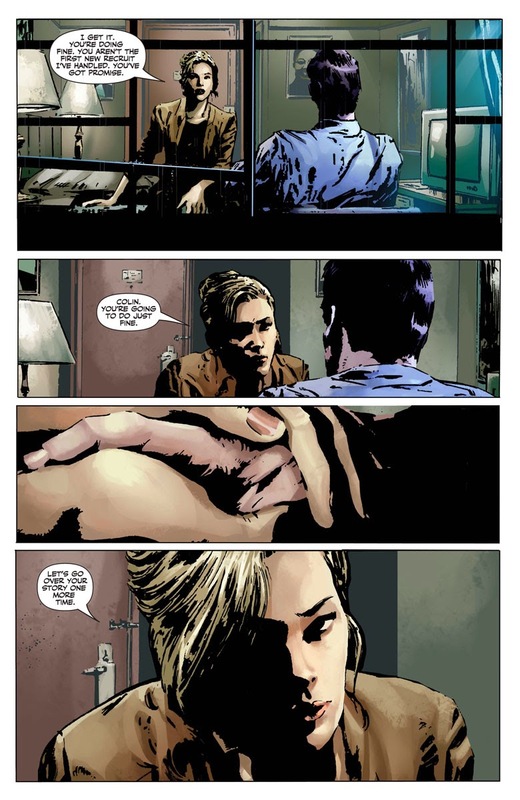 Likewise, Kindt's characterization of Roku as an extremely ruthless individual is handled through a briefing overlaid on Roku doing the things that make her so feared. 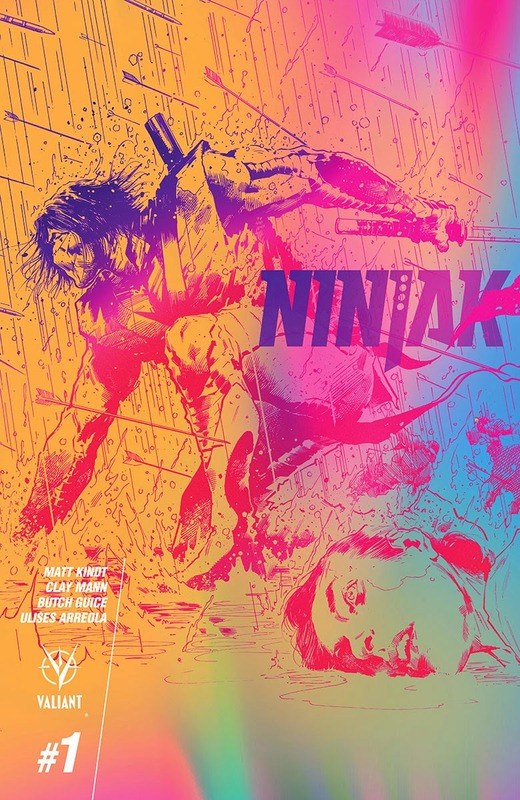 Kindt uses the two characters of Ninjak and Roku as a means of carrying the story, as their first interaction dovetails nicely into the larger plot being sketched out. 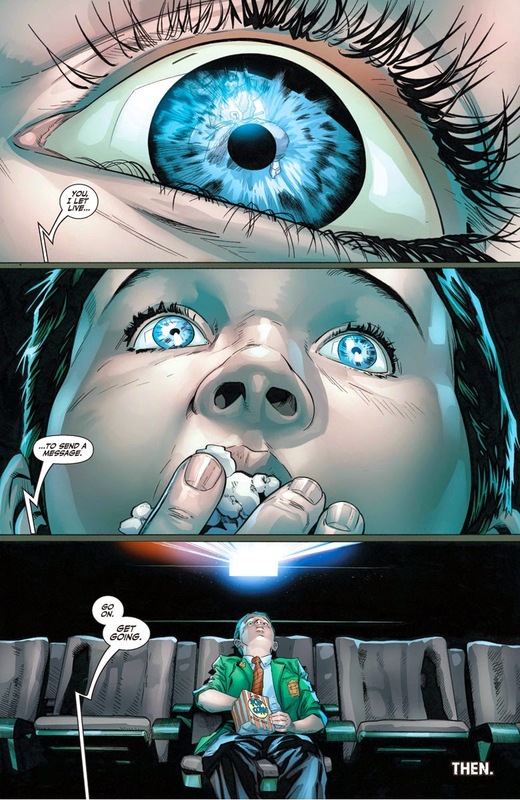 Clay Mann's pencils are extremely sharp and well-detailed. His work is most recognizable from Marvel X-Men titles and Ninjak #1 has that superhero feel to it. 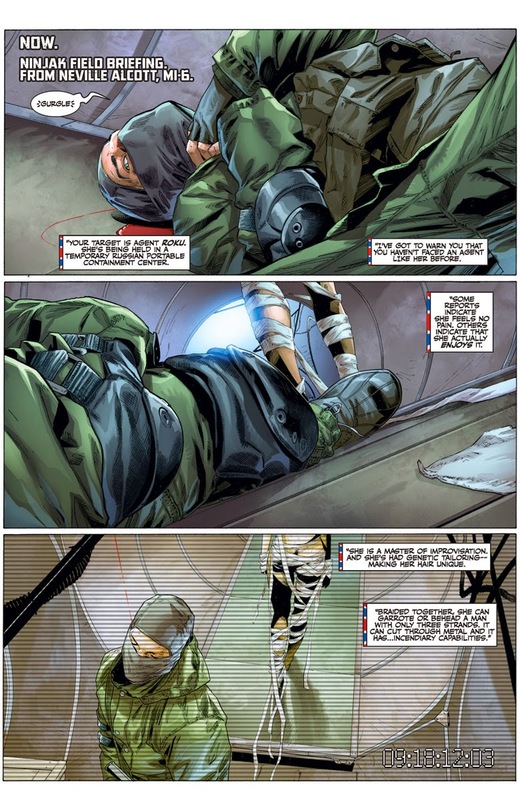 Each panel features a slew of intricacies and Mann excels in illustrating the action sequences. 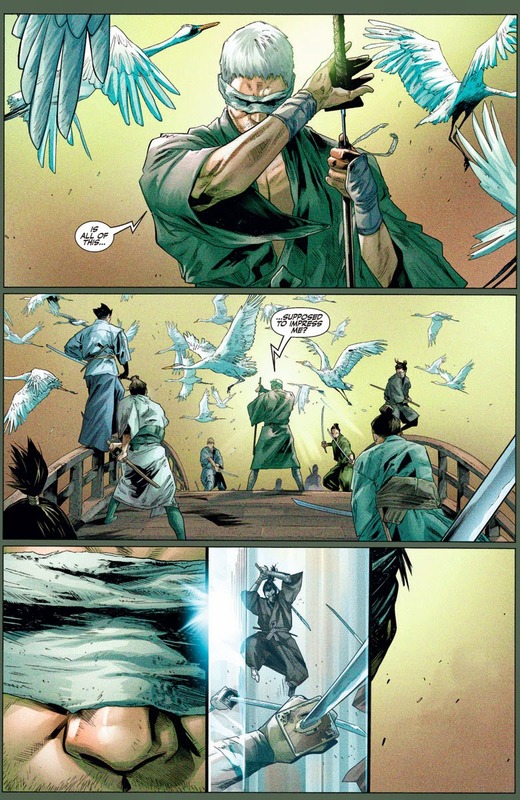 Ninjak's first encounter with Roku is a flurry of panels that feel frenetically arranged, but demonstrate an understanding of choreographing a battle with a fluid presentation. Seth Mann's inks are up to the task as well, accentuating the characters in a way that makes them stand out to the reader that's easily discernible amidst the background action. And Arreola's colors are bright and vivid, drifting between the purple and black of Ninjak to greens indicative of a lush estate. 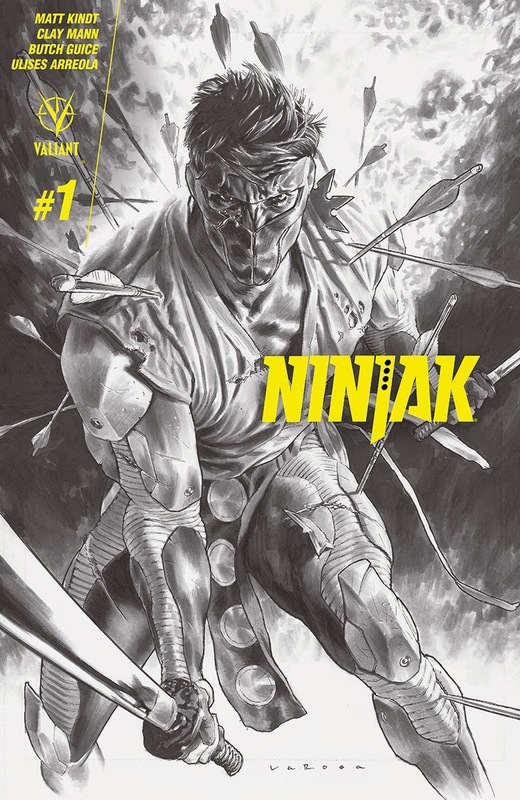 Ninjak isn't shy about his talents and displays them quite proudly in the fantastic first issue of the new ongoing series. He's characterized as extremely adept at his job, which requires a sword as much as it requires spying talents. 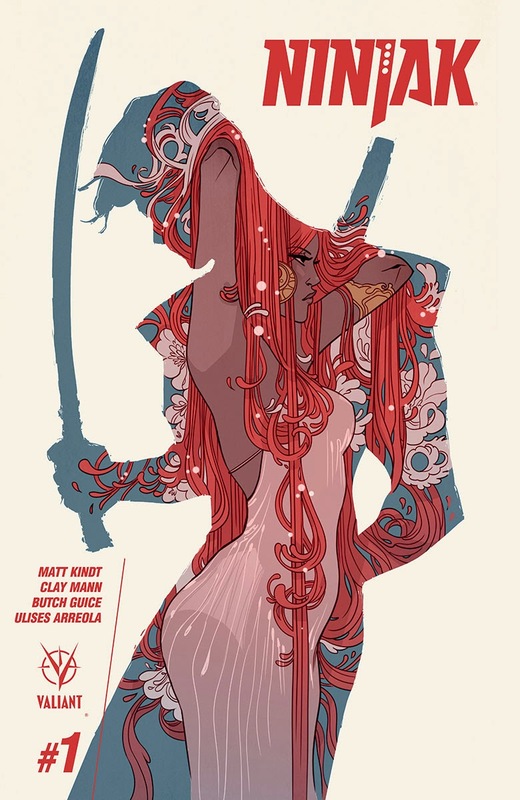 Kindt makes Ninjak #1 more than just a story about a ninja fighting; instead, he blends plenty of espionage into the mix that gives the book substance. The duo of the Manns on art perform exquisitely, as all the characters feel like they have weight to the presence in the book. 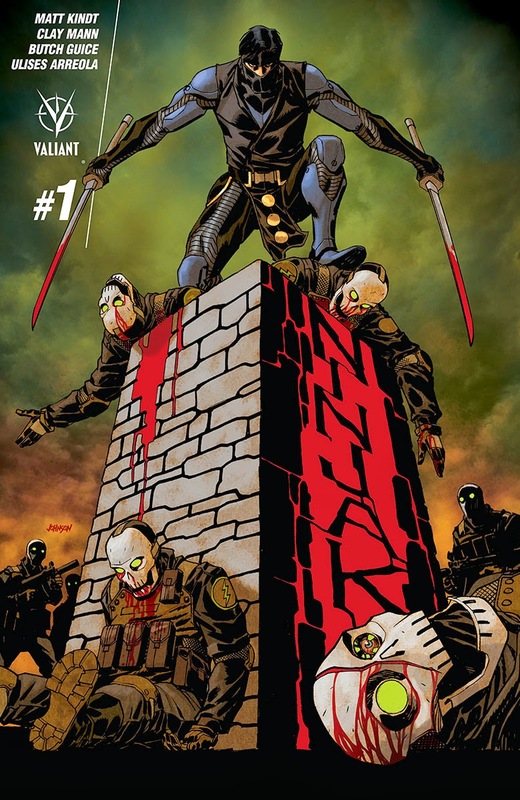 Ninjak #1 is a fantastic first issue that hits the ground running and offers readers a lot to sink their teeth into. 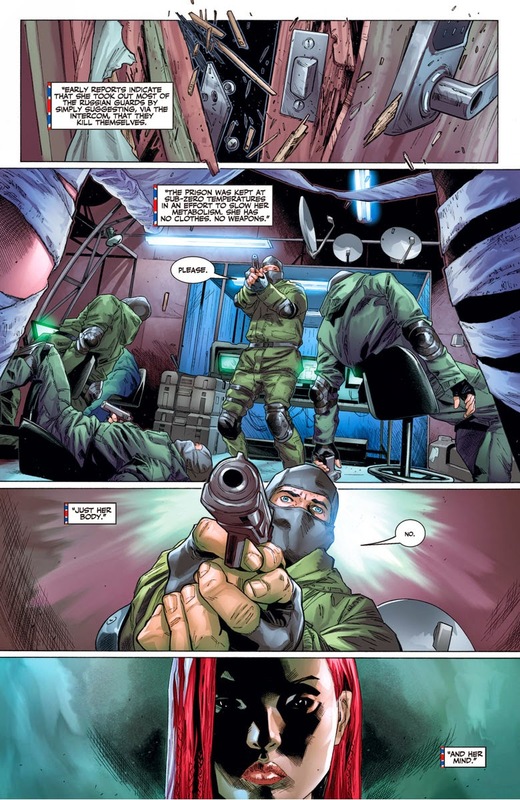 Ninjak #1 is in stores now with interiors below.